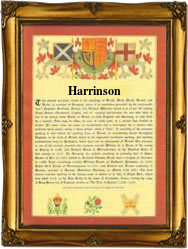 Recorded as Harringson, Harrinson, Haironson, Harinson, Harynson, and possibly others, this is quite a rare surname. It is a patronymic, almost certainly English, and has been around for at least five hundred years, appearing in the Elizabethan times, although its ultimate origin is unproven. It may derive as a dialectal of the personal name Henry or Henryson, from which we have Harry as in Harries or Harrison, with the "n" as a retention from Henry to aid pronunciation. An alternative is from Harrin or Harring, believed to be a short form of the popular surname Herring, and denoting a fisherman. Many surnames suffer from what can be described as "blur". This is when a name breaks away from its original spelling, and hovers around between several spellings until eventually establishing its modern form. Sometimes this happens overnight, but more usually as with this name, the link to the original spelling, which our guess is Henryson, was broken in medieval times. Examples of the surname recordings include John Harrinson at the church of St Katherine by the Tower (of London) on February 7th 1591, and William Harinson at St Botolphs without Aldgate, on December 14th 1712.